The Salisbury Township, Pennsylvania WWTP discharges into an unnamed tributary which leads into the Pequea Creek Watershed as part of the Susquehanna River Basin. Impairments of the local waterways have been attributed to excess nutrients, with the primary focus on phosphorus control. Ultimately, these waterways deliver into the Chesapeake Bay where treated wastewater is responsible for 22 percent of the phosphorus loading and 19 percent of the Nitrogen loading into the bay (www.chesapeakebay.net). As a progressive member of the Chesapeake 2000 agreement, Pennsylvania has implemented measures to reduce the Nitrogen and Phosphorus loadings to the bay by 6,750 tons/year and 411 tons/year, respectively (www.depweb.state.pa.us/chesapeake). With the goal of removing the Chesapeake Bay from the federal Clean Water Act’s list of impaired waters by 2010, townships like Salisbury were sought to comply with strict discharge requirements for Nitrogen and Phosphorus within this timeframe. With promulgated limits on Total Nitrogen of 6.9 mg/l and Total Phosphorus of 0.86 mg/l, Salisbury Township also had to contend with an increase in flow from 240,000 gallons per day to 580,000 gallons per day. 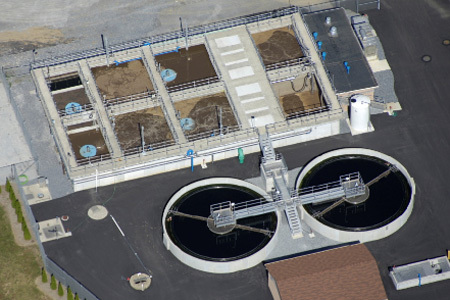 The operational, process and constructability aspects of the AquaPASS® Phased Activated Sludge System were evaluated, with focus on chemical addition, energy management and operational flexibility.